Hair is not my strong point, the most I would usually do is shampoo... maybe condition, if I can be bothered. My mum gave me a thick head of shiny black hair and I often feel that there was no need to do anything else than to wash it. I was recently sent a set of Mirenesse Thermal Wrap n Repair Hair Treatment. I am not usually too enthusiastic when it comes to hair products, bit this product had me curious. After speaking to a blogger friend who had used this type of hair treatment previously and found it to be good, I decided to give it a go. Application: I unwrapped the crap, tried to put as much hair as I could onto the top of my head to put the cap on then proceeded to tuck any stray hairs into the cap. My hair is short so it was not difficult. However, I can see how this may be a difficult task for someone with long and stubborn hair. The Process: Once the cap was on, I massaged as per instructions and left the cap on for 20 minutes. Cap off: I took the cap off and jumped back into the shower to give my hair a good rinse. My hair smelt great and felt realllllllly soft. The following day: My hair was literally glowing with shine. My hair is usually pretty shiny but I personally haven't seen it this shiny. It still smelt fantastic. I still noticed a few fly aways but my hair was so soft and smooth. 2 days later: Hair still looked, smelt and felt as good as it did on the following day. My hair felt really clean, I usually wash my hair every second day but because it felt so clean I didn't wash it until the FOURTH day. I don't if that's what the mask is suppose to do or if it's just my hair! Would I use it again? Yes, definitely. My only qualm is that I have to jump out of the shower after I shampoo my hair to put the cap back on. I probably would use it for an event - a wedding (I think I'll have quite a few of those coming up) or a special event where I want my hair to be beautifully blinding. I can't see it as something I would use on a weekly basis because I am lazy! But I was amazed with the results and surprised by how much I liked it. If you spend a lot of time on your hair, you can probably replace one of your treatments with Mirenesse's thermal hair mask. I've used a few different products before but this one seemed to have given the most "WOW' result thus far. Shades: While I was able to find my summer, winter and in between shades within the available shade range for this foundation, it will prove to be a challenge for others. If you have very fair or darker skin tone. Texture: As advertised, this foundation is lightweight upon application and easy to blend with your brush or fingers. The consistency of the foundation is very runny. Finish: The finish is indeed glowy, don't worry you won't find any shimmer particles. It looks like your skin but with a really healthy holiday glow. 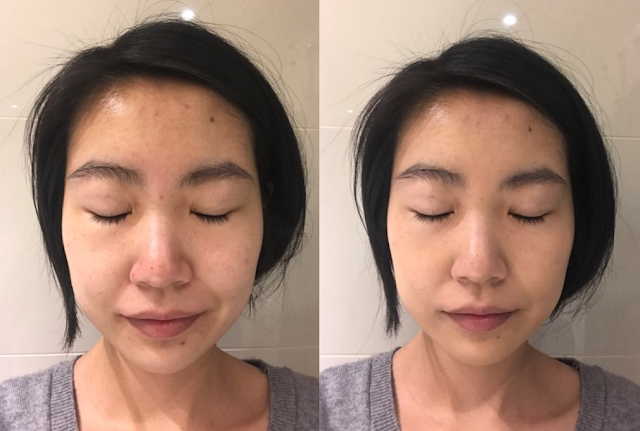 Coverage: Medium coverage as claimed, it did not minimise my pores but it did make my skin appear more seamless and covered most of my freckles. However, don't use this on raised pimples, it will slip off. 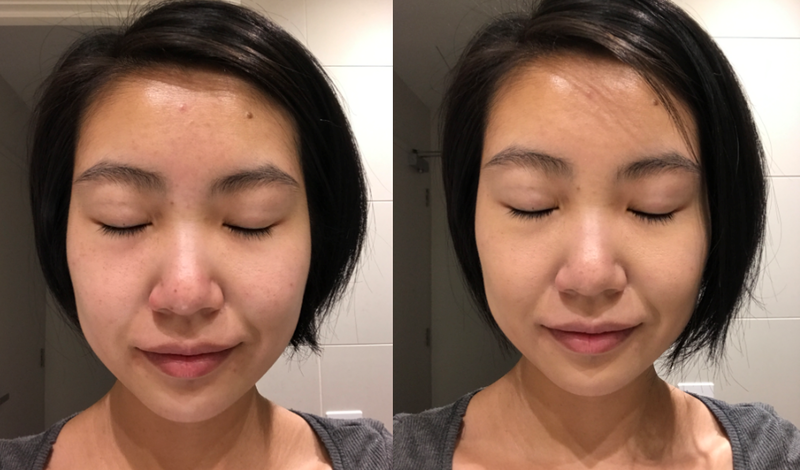 Dry Skin: This is where I encountered my issue. Everything was going so well with this foundation, my skin looked great. Whilst it didn't dry out my skin, it did however cling onto my dry spots (mainly on and around my nose). For example, the area around my pimple is usually dry and this foundation will accentuate those dry parts. I used it on good skin days where my face is completed clear and very well nourished/hydrated with serum and lotion, the aftermath was much more pleasant. The foundation sat on my skin really nicely. Wear Time: I wore this for the full 8-9 hours at work and the foundation mainly stayed put with a bit of congestion going on between my brows. Otherwise happy with the wear.